Governments, scientists and businesses must do more to ensure the web stays open for all, says Sir Tim Berners-Lee. 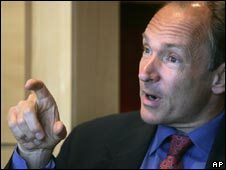 The web pioneer made the call while announcing a partnership between the Web Science Research Initiative (WSRI) and the National Endowment for Science Technology and the Arts (NESTA). The WSRI is studying how the web is growing and is seeking ways to make the most of its potential. The partnership comes as BT announces sponsorship of the research initiative. "The development of the Web will have major social, economic and political implications for our future," said Sir Tim. "At its core must be a commitment to maintain the principles of openness as a platform for the sharing of information," he added. The WSRI was co-created by MIT and the University of Southampton and aims to understand the forces underpinning the success of the web and how those guiding principles can be preserved and enhanced. The WSRI and Nesta partnership has been set up to look at ways to ensure the web stays open and easy to use. It will also consider ways the UK can capitalise on the rapid growth of the web. Nesta announced its initial support for the WSRI in May 2008 when it said it would provide cash to help the new organisation get going. The fresh injection of money by telecoms giant BT will be used to get the projects research programme under way. BT has not disclosed how much money it has given to the project. How will the web change the world?